Merging the advanced lightweight aspects and advantages with contemporary low profile double-barrel tile artistic, Clay tile is perfect for re-roofing or wherever weight, cost, and durability are main concerns. Clay roof tile guards the building, offer possibilities for communication of identity and cultural legacy. Clay roof tile meets the necessities of modern house construction. The modern manufacturing techniques boost this permanence by offering customers a roofing product that will definitely last a lifetime. Roofing companies have the wide-ranging selection of profiles and styles of clay tiles in the Los Angeles, from traditional mission style tiles to flat clay tiles that convey the aesthetics of natural clay tile. The exceptional design of the conventional clay tile lets you select from an extensive range of installation options including staggering, serpentine patterns, boosting, and a lot more. Clay tiles outperform almost any roofing product in market. Grade 1 clay tiles could survive a range of climate conditions without losing the splendor. Clay tiles have proven its durability, artistic appeal, and permanence over the years. Clay tiles roofing products are available in extensive variety to fit your budget. A clay tile roof will meet every project’s style and finances. Install clay tile in Los Angeles with AP Roofing. WE WILL BEAT ANY ROOFING QUOTE Like so many L.A. residents and happy customers, you will be glad you found us. After all, you deserve the best roofing workmanship along with the best prices, but most importantly, because the of this economy. You must be sure your investment is not only protected in the future, but also that it's handled professionally without cutting corners in material, workmanship, or contractors' licenses. Because our work projects are diligently planned, our team works fast and are extremely efficient -- which in turn translates into a substantial savings for you, our much valued customer! 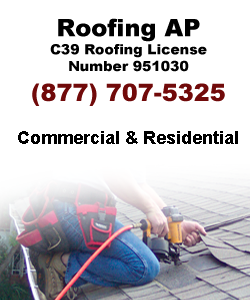 Why not let us quote your next roof repair project? Save hundreds in Energy Costs with a New Roof We know Los Angeles, and we know roofing. To see a detailed list of our works and the progress please see our project page. Our support is available to help you on the following days.